A wonderful tea time snack with tapioca and chicken will be a great snack idea. right? Mashed potatoes are often used for making chicken balls and chicken cutlets. But if you have some leftover cooked tapioca roots, then why should we go for an alternative. It is really hard to have the leftover cooked tapioca as its own the next day. Turn them into yummy snack so that kids and adults equally beg for more. Cassava or tapioca is a starchy root vegetable which is a rich source of carbohydrate. This can be cooked by steaming, boiling, baking and frying. The edible portion which is inside the thick brown outer skin will become soft and creamy once cooked. Though frozen tapioca which is cleaned and chopped is easily available, i prefer always fresh tapioca which tastes totally different. Here is the recipe showing how to make tapioca balls with cooked mashed tapioca and shredded chicken. Hope you all will try this tapioca recipes at home. Peel the skin of tapioca root, wash them and cut them into big pieces. Pressure cook it along with salt and enough water to immerse the roots. Pressure it for 2 or 3 whistles or until done (it depends on the tapioca used). Drain the water and set aside. Here i used left over cooked tapioca. Mash them well and set aside. Set the shredded leftover curried chicken or fried chicken aside. If not, marinate the chicken pieces with turmeric powder, chili powder, coriander powder, salt and lemon juice.Shallow fry them and shred them (once cooled )by pulsing them for few seconds in a blender. I used leftover fried chicken, shredded. Heat a pan with 1 tbsp of oil. Saute onion chopped and garlic paste until raw smell goes off. To this, add shredded chicken and mashed tapioca. Mix well. Check for salt and spices. Toss for few minutes until well combined. Make round small lemon sized balls, dip each balls in whisked egg mixture (add salt and pepper powder), then roll them in bread crumbs. Set aside. Heat a deep bottomed pan and add oil for deep frying. 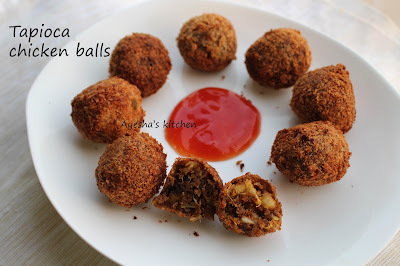 Fry these balls until golden and transfer it to a paper towel.